It is such a wonderful time of year! I love decorating for Christmas. We have just moved into a new apartment (a blog and pics will come soon) and have decorated for Christmas! I just absolutely love it. Last year we decorated, but we had a fake tree. It just wasn't the same. The only reason we did it was to save us money in the long run and also because we wouldn't be home for the whole Christmas holiday. We travelled back to North Carolina and New Jersey to see both our families. That was such a fun time! But this year, moving into our new apartment, which just happens to be a basement apartment, there isn't room for our old fake tree. It is 7 1/2 feet tall, and well our ceilings are only 7 feet tall. You can see how this would put us in a little bit of a predicament. Boy was I excited that we could go get a real tree to fit in our little apartment. Adam and I went to a place that my brother and sister...in law (I don't like those words) told us about. They had some really pretty trees for a reasonable price. So we got our tree home and it was perfect. We put it up immediately. We decorated it with all the lights. I was the one who did the lights because I know how I like them done. In my family it was always my dad who did them to make them just perfect, and my brother does it now with his wife. They both claim it is the curse of man! I love it though and if I want them done right I do them myself. 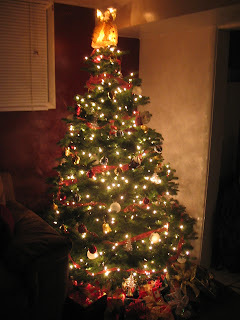 We put ribbon around the tree and then put LOTS of ornaments up. This was great. 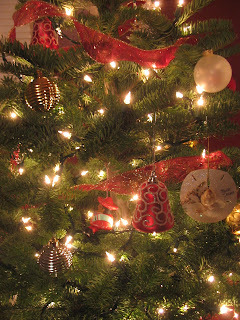 We loved the smell and the cheer it brought into our home. Then something awful happened. 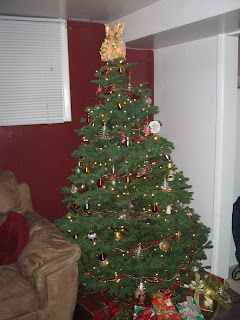 I guess it was our stupidity, but Adam and I thought the tree fit perfectly so we didn't need to cut the bottom off. We also figured because our Christmas tree stand had little spikes in it that all would be ok with the watering of the tree. Man were we stupid! After a day or two Adam checked in the water level and it hadn't moved. He also noticed that the needles were getting very spikey. So we did the unimaginable. You all should have been there. It was really funny to watch. We called our friend Jonny to help us. He and Adam lifted up the tree, because it was decorated and oh so pretty, while I climbed under the tree with a saw to try and cut off the bottom. Well I found out in the middle of all this that maybe I am not a very good sawer. So Adam and I traded positions and with all my muscular power...(or maybe Jonny just held up the tree on his own...but that is beside the point) we held up the tree. In just a few short stokes, the saw cut through the wood and everything was ok. Now our Christmas tree is pretty and healthy. I think we learned our lesson! ALWAYS CUT OFF THE BOTTOM OF YOUR TREE EVEN IF IT IS THE RIGHT SIZE!!!!!!!! !